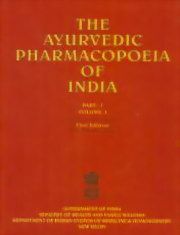 The Ayurvedic Pharmacopoeia of India is a legal document of standards for the quality of Ayurvedic drugs and substances included therein (Under Drugs and Cosmetics Act, 1940). This fifth volume, consists of 92 monographs on single drugs of plant origin. Pharma-cognostical, chemical and Ayurvedic standards of the parts of the plants used in Ayurveda are described in detail in each monograph. Each monograph describes macroscopic, microscopic characters along with their chemical standards identity, permissible limit of foreign matter purity & strength and have been developed on the protocol developed and approved by the Ayurvedic pharmacopoeia committee. It also prescribes about total ash value, acid insoluble ash, alcohol soluble extractive, water soluble extractive and thin layer chromatographic description (TLC). All this work was carried out by different scientific laboratories of CSIR, CCRAS, universities, academic institutions, Drug Testing Laboratory and Pharmacopoeial Laboratory of Indian Medicine (PLIM). The data has been finalised after confirmation of various samples obtained from different agro-climatic zones by the cross-section of experienced scientists in Ayurvedic pharmacopoeia committee and after careful scientific scrutiny. The standards have been consciously kept modest so that its implementation by the manufacturing companies becomes easily acceptable in order to maintain quality control and batch to batch uniformity. However, efforts of the manufactures should be to maintain higher standards of quality. Ayurvedic pharmacological properties like Rasa, Guna, Virya, Vipaka, Karma, etc. are also mentioned in each monograph along with their therapeutic uses, some of the important classical formulations and therapeutic dose. Appendix of this volume contains the details of the protocols used in determination of various scientific standards. Reference of ancient Ayurvedic literature in its original form are added, in order to authenticate the Ayurvedic statements made in each monograph. In general, this book is more user friendly for scientists, manufacturers, students involved in quality testings of Ayurvedic medicines, teachers of Dravyaguna, research scholars, physicians of Ayurveda and many others who have interest in the quality standards of Ayurvedic medicines. This book is included in the first schedule of Drugs and Cosmetics Act, 1940. Manufacturers are required to follow pharmacopoeial standards as these are mandatory requirements under the act.